Well, this surprised and delighted. 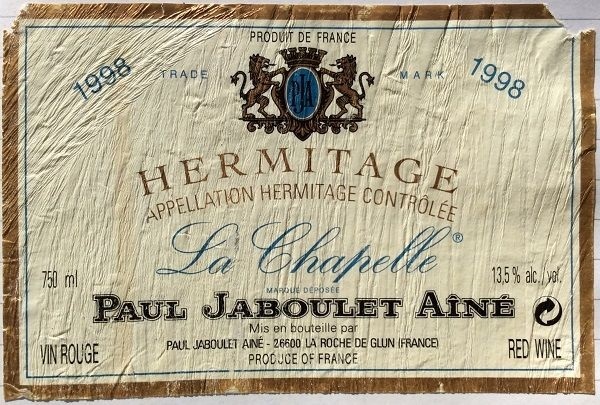 I’d heard several poor reviews of La Chapelles between about 1995 and 2005. However, although this was missing something in the mid / back palate, the complexity and interest on the nose is enough to make me wonder what the 1978 and 1961 legends must taste like! Medium depth garnet with a yellowing, broad brick rim. Red cherry and dried cranberries at the heart of the nose but 2° and 3° notes of fresh leather, Demerara sugar, black tea, cinnamon, vanilla hints, touch of black pepper spice, and grilled meat hints. Complex. Smooth, sweet fruit (red cherry) palate with coal smoke, toasty notes, fresh leather, and spicy finish. Long. Slightly chalky tannins emerge thru the finish. Now to 2015?